Ahmo's Gyro & Deli, Michigan n'a pas encore assez de notes sur ses plats, son service, son rapport qualité/prix ou son ambiance. Écrivez l'un des premiers avis ! Broiled eggplant with tahini sauce, lemon juice and garlic, pita is included. Cubes of sharp cheddar and swiss cheese, slices of blue cheese and feta cheese with fresh grapes. Falafels are made from chick pea beans and mixed with onions, garlic jalapenos and spices. Deep fried in 100% vegetable oil and served hot or cold, they are crunchy on the outside and fluffy on the inside. Delicious and not messy, falafels are the perfect food. Grape leaves are made with vine or grape leave and stuffed with rice, onions, spices, salt, and marinated in olive oil and lemon juice. Delicious and easy to handle, these little wraps make a great finger food for any occasion. Marinated chicken and rice cooked with green peppers, carrots and onions, displayed on a bed of leaf lettuce with fresh lemon and rice. Roast beef, corned beef, turkey, swiss, american and cheddar cheese with lettuce and tomatoes, pita bread and choice of potato salad, coleslaw, pasta salad, fatoush or tabouleh with choice of dressings. Your choice of filling wrapped in a special pita bread. Minimum 10 People. Prices Are Per Person. (E.G. 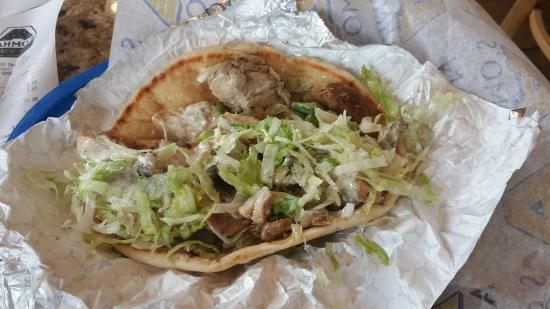 Beef, Lamb and Chicken Gyros with Lettuce, Onions, Tomatoes, and Cucumber and Garlic Sauce. Obtenez des réponses rapides du personnel et personnes ayant visité le Ahmo's Gyro & Deli.